Shopping online has its advantages and disadvantages. One of the advantages is to be able to shop in the convenience of your home and to view items from multiple vendors by simply moving to another website. Of course the big disadvantage is not being able to see and touch the product and really know if it is of high quality or not. However, one of the ways to overcome this problem is to read the reviews on online shopping sites. In fact, the careful reading of reviews can help you to find a jewelry box, or any other online product, that will live up to your expectations. When I shop online, of course I am attracted to items that have four or five star ratings. But that is not the whole picture. For example, if the product has only been rated by one or two people than I realize that the review might only be the personal opinion of one perfect and it might only reflect the particular experience of that person. That's why, in addition to looking for the positive ratings, I tend to gravitate towards products that have been purchased and reviewed by several people. It shows the popularity of the product and with a larger sample size, the reviews tend to be more accurate. It is also important to look beyond the ratings and get into the details of the reviews. The reviews will tell you if a product is sturdy and if it is really of high quality. The online photos of a wood jewelry box may look good, but until you touch the real thing you can't be sure. Fortunately the people who have posted the reviews bought the jewelry boxes and their opinions are important. Sometimes they may even report that the box is better than the photo and that is an exceptional value, while at other times they may express regret about the quality or features of the boxes. If a good number of people have purchased a particular jewelry storage product, and if they have expressed their delight then you can be sure that you are on the right track. However, negative reviews can also be helpful. If you are buying an electronic item then of course you will almost always read about the experience of someone who has bought a computer and it was dead on arrival or some other tragedy. This happens, but if it seems to be an isolated case, outweighed by many positive reviews, you shouldn't let the experience of one person scare you off. Also, one thing to look for in the negative reviews is what kind of customer service the manufacturer or vendor offers in cases like this. If the customer service representatives were "sweet and smiling:" and responded promptly then you can order items on that site with confidence, knowing that even if something is initially not quite right, you will be able to resolve the matter. 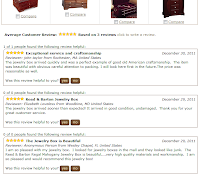 So, go ahead and start looking for a gift item or something for your own jewelry storage needs online, and use the posted reviews to guide you to the best possible selection. By Linea Riffel, contributing editor for ChasingTreasure.com, where you can purchase wooden jewelry boxes, leather travel cases, and more!